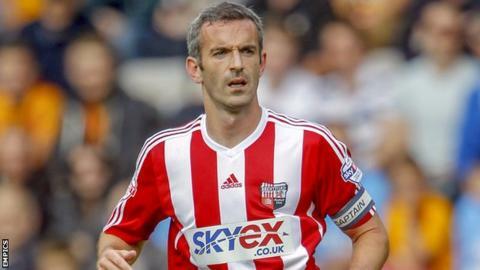 Brentford club captain Kevin O'Connor has called on the squad to seize the opportunity as they look to seal automatic promotion from League One. Seven points from their last five games will clinch a top-two finish. "We haven't quite been in a situation like this before," the 32-year-old defender told BBC London 94.9. "Everyone is in a positive frame of mind and we have got to make sure we finish it off and do it well. We have our targets we are still aiming for." He added: "We know it is a great opportunity but you have to work doubly hard. "It can turn so quickly if you don't hit your levels. It is close but I am not one to shout it from the rooftops until it is done." The Bees sit on 87 points - the highest points tally in their history - but are still not assured of automatic promotion. However the west London club have carved out a nine-point cushion to third-placed Rotherham. Brentford manager Mark Warburton says the club still have an eye on the League One title, with leaders Wolves just three points ahead. "For us it is relishing the pressure," Warburton said. "The players have earned this opportunity. They have created this nine-point gap but nothing is achieved yet. "Right now our first aim is to secure promotion. Secondly it is how high we can go. Our target has to be 102 points. "We are well aware of the fixtures. We know we have got tough games coming up but Wolves have to entertain Rotherham and travel to Leyton Orient. "Somewhere maths tells you that people will drop points." Brentford missed out narrowly on automatic promotion last season, missing a last-minute penalty in their final game against Doncaster which would have put them in the top two, and then were beaten in the play-off final by Yeovil. The Griffin Park outfit made a slow start to the season but their bid to reach the second tier for the first time since 1992-93 has been based on a 19-match unbeaten run between October and February. Warburton, who was appointed in December and has lost just twice in 22 games in charge, has been impressed by the quality of promotion-chasing sides in the third tier this season. "This season was deemed as a far more difficult year to secure promotion and that has proved to be the case," he said. "In a normal year Wolves would have been well clear. Eighty-four points won it and we had 79. Had we won the last game, 82 would have got us up and almost as champions. "Teams are looking at three figures. It is an amazing year but it is what it is and we have to deal with it."